Our law firm handles hundreds of rear-end car crash claim in Maryland every year. We have never lost a rear end accident case. Ever. As we talk about below, there is a presumption of negligence in Maryland against the rear-ending driver. While the insurance company will often deny liability or offer the victim who was rear ended less money claiming they have a viable claim that the victim was also negligent, these types of defenses usually drop off before a jury ever hears them. Conversely, if you are the driver of a vehicle that rear-ends the lead vehicle, our lawyers are not going to take your case. Maryland law requires drivers to follow at a safe distance which means that you need to create spacing -- and stay alert -- for sudden or unexpected stops the lead driver might make. We do not see a lot of rear end cases where both drivers are going at a high rate of speed. Seventy-five percent of all rear-end car crashes involve a car that is either stopping or has already stopped. The statistics for our clients are probably a lot high More than half of these kinds of crashes occur at or near intersections. Both human and property damage losses from rear-end crashes costs the citizens of Maryland millions of dollars each year in medical costs, lost productive time, and numerous property damage insurance claims. The Department of Transportation's study estimates that the injury costs alone for rear-end car and truck crashes exceed $5 billion per year. Improper following distance was the primary factor in the majority of auto accidents in Maryland. Statutes in most states prescribe the distance to be maintained by a motor vehicle from the one ahead in general language, such as a "reasonable and prudent" distance. In Maryland, the rule is stated as follows: "The driver of a motor vehicle may not follow another vehicle more closely than is reasonable and prudent, having due regard for the speed of the other vehicle and the traffic on and the condition of the highway." Maryland Transportation Code Annotated, § 21-310(a) (2005). Accordingly, drivers following another motorist must remain a sufficient distance behind so as to be able to avoid an auto accident. 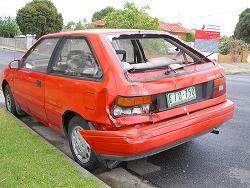 The issue is how to prove negligence from the occurrence of a rear end accident. Stated differently, how do you show some specific act of negligence or can we infer fault in a rear end accident? This Montgomery County Court of Appeals case offers insight into how this situation is handled in personal injury cases in Maryland. The facts of this car accident personal injury case are quite simple. The Plaintiff, Jose Andrade, stopped his vehicle at an intersection, waiting for traffic to clear so that he could turn right. Mr. Andrade was stopped for approximately 25 seconds when his car was struck in the rear by an automobile driven by the Defendant, Ciro Panemeno. By coincidence, both Plaintiff and Defendant were friends who were heading to a shopping center in Montgomery County. The impact of this rear-end car accident drove Mr. Andrade car four to six feet into the intersecting road. After the collision, the defendant backed his car directly behind him, driven by Shanaz Housein. The judge dismissed Ms. Housein after she testified that the damage to the front of her car was from an earlier accident, not from Mr. Panemeno backing into her. As a result of this auto accident, the Plaintiff suffered a neck injury of unspecified severity. The only thing I have is a rear end collision between Mr. Andrade's car in the front and Mr. Panemeno's car to the rear of him. They did bump one another, or actually Mr. Panemeno did bump Mr. Andrade. That is the state of the evidence at this time, but all that has shown to me is that an accident occurred, and I have nothing else. Nobody saw him following too closely, we do not have any skid marks indicating perhaps speed. I do not know the distance that these cars were following one another. I have no indicia of negligence whatever. All we have is the happening of an accident. I will grant the motion. The Maryland Court of Special Appeals agreed with the Montgomery Court trial court judge that the only evidence presented by the accident attorneys was that of a rear end auto accident. But the court ruled that, in Maryland, when a accident is caused by the "operation of some instrumentality in the exclusive control of defendant, for which no explanation can be offered by the plaintiff, under circumstances which involve a breach of duty on defendant's part to avoid injuring plaintiff through the operation of such instrumentality, a presumption of negligence arises from the happening of the accident." In other words, in rear end car accident, victims get a presumption that the rear end collision was caused by the rear-ending driver's negligence. This case makes clear that there is an evidentiary presumption of negligence that arises in Maryland when a motor vehicle is lawfully stopped on a highway waiting for traffic to clear before entering an intersecting highway and that vehicle is suddenly struck from behind by another vehicle. The presumption of negligence in Maryland rear end accidents is, however, rebuttable by the defendant's accident lawyer. The procedural consequences, once a prima facie case is established, require that the person against whom the presumption is directed assume the burden of going forward with the evidence, but the burden of persuasion remains with the plaintiff. In other words, the burden of proof remains with the plaintiff. The plaintiff must, for example, prove that the personal injuries suffered in the accident were caused by the defendant's negligence. But once a prima facie case is established by showing evidence of a rear end collision, the defendant In Maryland has the burden to overcome the presumption of negligence. Contact Our Law Firm Online or at 800-553-8082. We can help you get the compensation for your claim that you deserve.